The biggest challenge when a user complains of slow application is diagnosing why it’s slow: Is it due to a code-level issue or a database issue? Should we call the DBA or the application manager? Performance problems with the database can cause up to 70% of all application performance issues in production, according to consensus among database practitioners and experts. Numerous factors ranging from poor query design to missing indexes to a database performance issue in the backend infrastructure can negatively impact application processing. If there’s a poorly designed database query that is slowing down user transactions during application access, how can you flag it immediately? 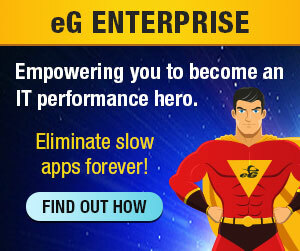 eG Enterprise is a converged application and infrastructure monitoring and troubleshooting solution that helps you understand how infrastructure issues, including database bottlenecks, are affecting application performance. Using byte-code instrumentation, eG Enterprise traces every user request processed by the application all the way to the database and back. This helps understand which stage of application processing is slow – whether there’s slowness in the application server or in the database; whether it’s an application code-level issue or database query issue. Watch this 3-minute video and learn how eG Enterprise uses distributed transaction tracing to isolate slow database queries that are affecting application performance. Slow queries are not the end of it. 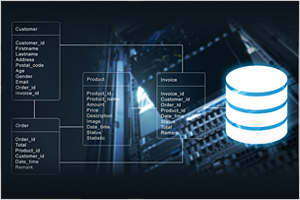 There could be many other database and other infrastructure issues affecting your application. For example, memory shortage on a VM where the database is running, hotspots in the SAN array, slow network connectivity, cloud infrastructure issues, and so on. Read this white paper by APM expert Larry Dragich and understand the need for a converged application and infrastructure monitoring strategy.